Many of us in the prepper world feel like the news is biased, or at best, incomplete. 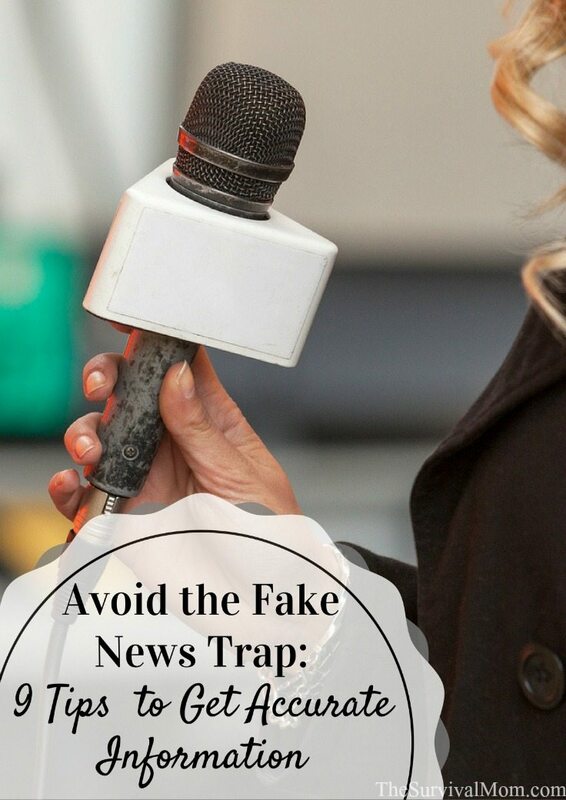 Lately, “fake news” has been in the headlines, reaffirming that we can’t believe what we see or hear when it comes to the news fed to us by mainstream media. One prime example happened toward the end of December, 2016, when The Washington Post reported with the sensational headline, “Russian operation hacked a Vermont utility, showing risk to electrical grid security, officials say.” Wow. In the prepper community we are more aware than most of the grid’s vulnerability. Immediately, this story raised concerns — but then just as quickly, fell apart. Turns out that a laptop computer belonging to the Burlington Electric Department had acquired malware. The malware may have been written by a Russian — but malware is readily available for sale on the open market and most computer owners have had malware issues many times. The laptop wasn’t connected to the grid, the malware was removed, end of story. There was never a “Russian operation hack” — not even close. So why would an established newspaper of record rush to publish a story that was so quickly debunked? Basic fact checking would have saved The Washington Post from much embarrassment, especially after having published this article, condemning “fake news” and listing “fake news” websites. Even without fake news as an issue, it’s hard to get the full picture in a 30 second “story” or a brief headline. Additionally, many of us assume that when SHTF, mainstream news sources will be unreliable or consist of pure propaganda. And there’s just so much information out there that it seems overwhelming at times. It’s tempting to just ignore it all, and, if you’re smart, you’ve figured out that there’s very little “news” that’s completely believable. But making wise and effective preparedness decisions means having a somewhat accurate view of what is, and is not, happening. After all, how will we be able to discern an accurate picture when it really matters if we don’t practice discernment now? 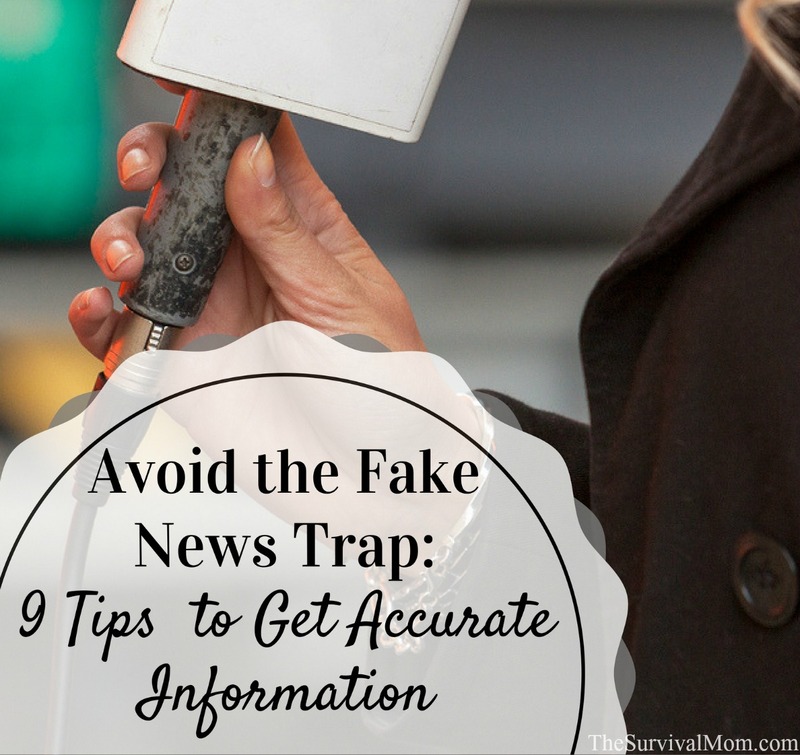 If you can’t rely on the accuracy of information, then what do you base your survival decisions on? In my history classes, I tell my students to think of this in terms of what might be in history books 40 years from now. In other words, the type of events that could change history. A celebrity marriage or divorce? Unlikely. Two countries ending portions of a nuclear containment agreement? Very likely. Pay attention to those things with geopolitical significance, and ignore the rest. Not every news story is worth your time, and this is a fast way to decide what to pay attention to. Every story, no matter how short, should cover these bases at a minimum. If, for some reason, the information isn’t available yet, the aspect should still be addressed. For example, if the police are still looking for the bank robber, the “Who?” can’t be answered just yet, but the story should still say they are “following several leads” or something similar. Identify what pieces of the story are missing from the reporting. It’s possible the missing information has been purposely left out. What part of the story is missing or leaves basic questions unanswered? If you find that a story is missing some aspect of basic reporting, try to find the missing pieces from another source. For example, many recent domestic terror attacks have involved people of a similar religion or origin, but many mainstream news reports were leaving out this information in reporting, even if it was known. This was an instance where alternative news sources were reporting the information immediately. Details like that could matter immensely when it comes to identifying or categorizing threats (or lack thereof) to your family or personal situation, and you should try to find them. One very popular strategy by many in the media is using unnamed sources. “An unnamed source reports…” Who is the unnamed source and why isn’t their name being disclosed? Is it possible the source doesn’t exist and the information being passed along is the author’s own opinion? Or maybe the unnamed source is the journalist 2 cubicles over or the political enemy of the main person or cause presented in the story. Be very wary of news reports that frequently resort to this tactic. What are you observing on the ground and how does that line up with the story that is being reported? In the most recent election cycle, my friends and I kept counts of political yard signs and bumper stickers. Although our counts weren’t statistically accurate, there was a significant discrepancy between our observations, and polling numbers reported. If a political poll as reported just doesn’t match up with what you are observing, then you might wonder if the polling is accurate. ALWAYS trust what you observe over what you are told. This skill will be absolutely crucial if the SHTF, as most “official” reports are going to be untrustworthy. Find the original quote or document–what does it say in context? It’s very common for headlines to say one thing when, in context, the meaning of a statement is completely the opposite. If a statement being reported seems particularly shocking or hard to believe, take a few moments to find the statement from its original source and read it in context. You might be able to find the original speech or interview on YouTube, for example. Watch or read as much of the original context as you can, and decide for yourself what the person meant by the statement. Always trust your own interpretation of any original source over a second-hand account or third party interpretation of what happened. Are the same descriptors used in similar cases? A friend of mine just shared an article about political corruption where the political affiliation of the accused was left out. This is a detail that is directly related to the nature of the story, and its omission may indicate a bias on the side of the reporter or news agency. Be alert to missing details, and allow them to tell you something, too. Similarly, be aware of optics. Images can be used to sway opinion, even if it doesn’t exactly reflect the facts in the news story itself. Journalists know that most people will read the headline, glance at the image, perhaps read the caption, and then draw their conclusions. One particularly obvious example was in the unfortunate shooting of Trayvon Martin by George Zimmerman back in 2012. Even when the facts emerged that Trayvon was a very tall and mature looking 17 year old, media reports continued to publish a photo of the young man when he was 12. In comparison, they used a mug shot of George Zimmerman taken 7 years earlier and continued to use that photo for weeks. Neither photo was accurate and that did a disservice to readers and viewers everywhere. This might also be known as “follow the money.” Recently, there have been major headlines about various pharmaceutical drugs becoming very expensive, literally overnight. Why is this happening? The answer to those situation and many others can be answered by asking who benefits from these changes. One caution: it’s not always so obvious as saying, “The greedy companies, of course!” You may have to go back a few layers. Sometimes, alternative news sources will do this for you. How has the narrative changed? In the book 1984, George Orwell wrote, “We’ve always been at war with Oceania.” For news stories that have been going on for a while, compare older stories with more recent ones to see how the terminology or perspectives have changed. For example, at the beginning of the Syrian war, there was a “refugee” issue. More recently, the news stories refer to these displaced peoples as “migrants.” Sometimes, the change is because more details have emerged, but more often, it’s because the story is being spun a certain way. In an election year, this question is easy to answer: the information is likely coming out at a certain time in order to hurt a particular candidate or sway voters. But in other times or situations, it may be harder to discern. For example, 24/7 coverage of police shootings overshadowed passage of CISPA, while arguments over flags and bathroom signs covered up the release of 28 pages from the 9/11 report and news of coup d’état’s around the world, and so on. Did you wonder why all the evil clown stories were suddenly in the news? Gotta wonder what was going on at the time that we weren’t supposed to know about. In many (perhaps most) cases, inflammatory issues are probably just being used as a distraction from something that is actually more important. Pick just one or two of these questions posed above and apply them to every news story you hear or read this week. As for overseas sources, you could try the BBC, UK Telegraph, Canada Free Press, or similar. While I’m not necessarily endorsing these sites or their contents, they can at least provide alternative information or perspectives, and get you thinking more critically about news in general. Read books like James Rawles novels, or any of the Economic Hitman books, The Fourth Turning, or The Next 100 Years. These books offer new perspectives, and they could certainly help shift your paradigm on news reporting and current events. Learn how to recognize false arguments. The Fallacy Detective makes this very easy and helps you identify such tactics as strawman arguments, faulty appeals to authority, an ad hominem attack, and many others. With this information in hand, watch a political debate on YouTube and try to identify the false arguments made by the candidates. Eventually you will find that single sentences or even phrases in new stories will pop out at you as significant, and you’ll be more comfortable relying on your own observations and conclusions. Having a more accurate view of the news, and being able to identify what is and is not important, could one day be the difference between your timely decision to act, or missing a critical window of opportunity. What steps are you going to try this week? Survival Survey: Actual Doomsday Preppers Tweets. How would you respond? It’s so interesting how an event occurs, say Obama recently designated 1.5 million acres in Utah and Nevada as 2 new “national monuments.” Well, that is a fact: 1.5 million acres, Utah and Nevada, national monuments. But that’s where it starts getting interesting. Nice article Ms. Morrill, and congrats on the new ham radio license! You will receive benefits from that decision for the rest of your life. I don’t frequent any of the listed sites, because their writing style is so heavily slanted towards “panic about everything” and, quite frankly, the overall noise level of them is just too high for my taste. It reminds me of a screaming, flamboyant pastor. To be fair, some people like that kind of delivery, but it’s not for me. I am of the opinion that if you are proactively searching for news (starting with your own search terms) you WILL find what you are looking for…right or wrong. Right off the bat you are skewing the results to be found. There’s no perfect answer for this problem, just remember you are baiting your own trap in a way. ALL news sources are biased. ALL of them. It’s simply because no two humans can tell the same story about an experience, even when they try their best. This is one of the very few tenets about life on earth that I will take to the grave with me. Once more…ALL OF THEM are biased. No big deal, just never forget that. I have a test that I use for news site, but it takes time, and so far all of them have failed to varying degrees. Yes, every single one I frequent including the few I trust the most. For the sake of this comment, “passing” is defined as no observable major bias. Here’s my test: Every site has a “front page” just like a newspaper or a magazine. Print or save a copy of that front page. Do it every day for a few months. Go back and review what they chose as worthy of being on their front page. Did the articles turn out to be accurate? Did they ever admit any errors that were made? Are opposing views welcome in the editorials? Were the headline article “the whole story” as was known at the time? Then let a pattern emerge in your mind. Is this really a news site, or an editorial site that perhaps you are labeling as a news site? Do you feel you could trust this site to accurately publish a story that represented something important you witnessed personally? What exactly do you consider to be an “editorial site” vs a “news site”? As I mentioned earlier none of my favorite news sources have passed this test. That’s not a horrible thing, but what do I do about that? I have no choice except to be honest with myself about their built-in bias. I must remember that most things in life simply don’t boil down to logical, indisputable facts. Take them for what they are, and in the final analysis, just use your head. Ok, so who’s failed the least on my personal list for non-fake (hahaha) news? Time for me to duck and cover. It’s The Wall Street Journal and Al Jazeera English. I like WSJ because I truly believe money is the great equalizer. Looking to grow our wealth is one of the very few things all westerners have in common with each other anymore. WSJ is a particularly cold and factual reporting service…kind of the opposite of Bloomberg Finance. Yes, the WSJ contains editorials but as I said earlier, I know the bias I am looking at and they seem to be more factual than most. Seriously, give them a 15 minute chance once a week if you haven’t already. The front page is free. As for Al Jazeera English, when they opened their video news service here in the states, at first I felt like a traitor for watching it. “Al” means they must be the enemy right? Oh well, at least I went to see for myself. I noticed that they did some things I really liked. Overall, they were actually quite factual and the women did not dress like they were at a Hollywood awards ceremony. Sure, they were sometimes critical of my government, but when they were, they had a tendency to target the political parties or the political policy itself, not the individual politicians. A great deal of their broadcast was spent on world news events that nothing to do with the US or our allies. How refreshing! Yes, I know who owns them. Yes, I know why they closed the US office. Yes, I still watch them, and yes, I know who is rumored to be purchasing their US studio later this year. Look it all up yourself. Or better yet, watch them sometime. I’ve found British news websites to be reliable and often cover stories that you don’t hear a peep about in American news sources. Yes, you are correct. Interesting, isn’t it? I’m always interested in new sites. Thanks for the suggestion. Another tip is that ‘general’ news sources often don’t understand technical or industrial specifics; look for a publication focused on that technical or industrial area to understand what actually happened and what its impact is – for example, when you hear about computer, hacking, or internet issues look to The Register or Wired for the story instead of CNN, USA Today, or your local paper. Yes! It is so so important to really analyze what these people are saying! You have a great list of alternative news sites… might I suggest the No Agenda Show (http://www.noagendashow.com/). They spend the majority of the podcast deconstructing what the media is saying… I think you might really enjoy! Yet another in a stream of good, useful, articles. Congratulations. Using your own brain and refusing to accept things at face value will benefit you in every situation. I hear a lot of people dismiss news from many sources because it’s “biased”. To which I ask, “But is it true?” That’s the rub. I can handle bias – it’s easy once you learn, like you said above, how to figure out what’s being left out or overemphasized. I didn’t know that all news stories should cover the questions of who, what, when, where, why, and how. Making sure that new is legit is difficult so I think that we all need to practice. It might be important to find someone who does know how to do this to show you how it works. In High School Journalism class we were taught that “the five W’s” MUST be in the story, in the header paragraph! Makes me so mad when all are not met. I think she’s onto something with making sure What, When, Who, Where, Why – plus the inconvenient “H” of How are met for a news article to have merit. Also if there’s a grammar error, the “journalist” and the story lose cred for me.